Has all her bricks, but no cement holding them together. Has an inferiority complex, but not a very good one. Has an IQ one lower than it takes to grunt. Has change for a seven dollar bill. Has FINO (first in never out) memory. Has his brain on cruise control again. Has his solar panels aimed at the moon. Has it floored in neutral. Has no discretionary intellect. Has no upper stage. Has nothing to say, but delights in saying it. Has only one chopstick in the chowmein. Has resonance where others have brains. Has signs on both ears saying “Space for Rent”. Has so few thoughts that when he free associates, it’s like watching tennis Has the attention span of an overripe grapefruit. Has the brains of a house plant. Has the Grand Canyon under the crew cut. Has the IQ of a salad bar / an ice cube / three below houseplant. Has the keen awareness of an ostrich in hiding. Has the mental agility of a soap dish. Has the personality of a snail on Valium. Has the same talent as Dr. Doolittle. Has two brains one is lost and the other is out looking for it. Hasn’t caught on that X and Y are relative values. Hasn’t got all his china in the cupboard. Hasn’t got the brains God gave a cat. Having a party in his head, but no one else is invited. He can only type in upper case. He can push but he can’t pop. ABOUT US : Laughter is the best medication as the old saying says, we at JokesPinoy.com will supply you with all the comical filipino quotes and photos in tagalog language. Back in 2013, a group of Filipino OFW (Overseas Filipino Worker) got bored and they make an effort to look for some amusing quotes on the web simply to have fun but sadly most of the websites they found on that time are having an obsolete jokes and have no interaction with the users. From that instant, they then got an idea to build their own jokes website and let other users to give their jokes or opinion with the present jokes. Following the funds and concepts gathered, JokesPinoy.com was born, a website that let the user share their jokes and let them have dialogue with other users too. Since the website has been launch, tens of thousands of visitors are coming each day to read jokes and have fun on the website and also as giving their opinion on the jokes they read. 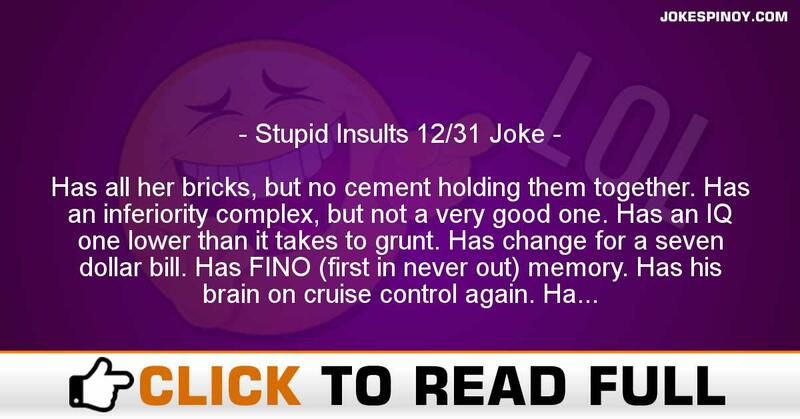 We hope from JokesPinoy.com that this website may provide you some grin and happiness, Life is Short so have fun on it. DISCLAIMER: Some of the jokes, photos and videos found in this site are not created by us, they're created by our users or they just get it somewhere in the internet just like 9gag, youtube, metacafe, vimio and etc. We respect copyright information which is posted here including funny pictures and humorous videos. If encase there are files posted here in our site that is possessed by your and you do not need to share it to anybody subsequently fell free to contact us to remove it. Most of the language used on this site was in tagalog and some are bisaya that are both filipino language which originated from Philippines, in case you wish to translate the joke to english you can used an online translator to interpret it from tagalog to english.